"When the sprinters go to their marks at the Olympic Games starting July 28 in Los Angeles, on oldtimer will see himself in their shoes -- and thinking about the one he missed. "Harold Quint, a lively 87, was picked for the U.S.Team to compete at Antwerp, Belgium, in 1920. "I qualified in regional trials," said Quint, " and went to New York for the finals. I made the team in the 100- and 200- meter and 400-meter relay. "About the time the team was ready to sail, I got the flu and they put me in the hospital and went on without me." United States runners won gold medals in all three of those events. Quint's teammate, Charles Paddock, copped the 100, Allan Woodring won the 200 and the four-man U.S. team came away with Olympic gold in the 400-meter relay. Photo taken about 1940 of some of Harold's relatives. 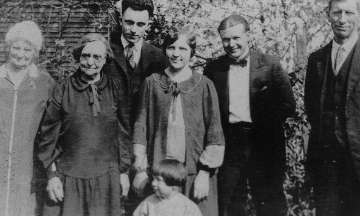 From Left: Albion Lincoln Quint, Melvin E. Quint (Harold's father), Alice E. Quint, Arah May (Morris) Quint (Harold's mother), Homer Albion Quint, Elizabeth Leigh (Maddox) Quint (wife of Homer). Children of Homer & Elizabeth: Joyce Lorene Quint, Ruth Clarice Quint, Darrell Arthur Quint, and Alice Marilyn Quint. Quint lives in retirement 3 miles up the Onigum Road off Highway 200 and enjoys the sunsets over Leech Lake's Agency Bay. He was a star sprinter at Drake University in Iowa. 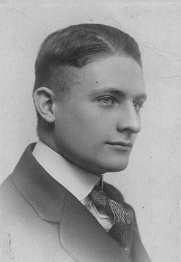 He spent a year in the U.S.Navy in World War I returning just in time to compete in the Drake Relays in 1919. He taught at Northeastern University...He was asked to stay in practice at Evanston, Ill., until he was 78, then moved to Leech Lake, an area he had known since 1924 when his family built a cabin on the site of his present home. It was mostly Indians living up on this part of the lake 60 years ago he recalled. ..."
Dr. Quint doesn't practice medicine anymore but advises some friends on home therapy for joint surgery. Until recently, he sang in the choir of the Community Church in Walker." Here is another old photo taken about 1931. Photo was probably taken by Mildred E. Quint, bride of Cambell Tribble. Married June 6, 1931. 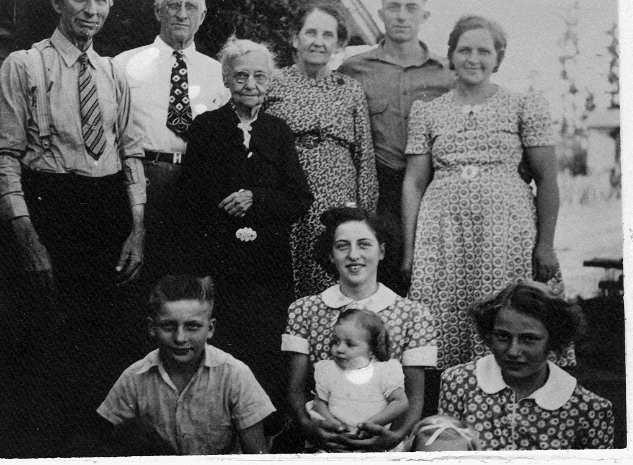 Left to Right are Kate Leigh (great aunt of Elizabeth), Alice E. Quint, Homer Albion Quint, Elizabeth Mattock Quint, Joyce Quint, Cambell Edgar Tribble, Albion Lincon Quint.